There are scenarios, when we have SOA Services (Composites), which uses Environment specific data in the transaction. Here 'environmentName' is variable name. STEP 1 : Use Assign Action in BPEL flow & add function ora:getPreference('environmentName') in required field. STEP 2 : Once your code is compiled & Deployed to Server, you need to set the value of this variable in EM console. STEP 3 : Login to EM console. 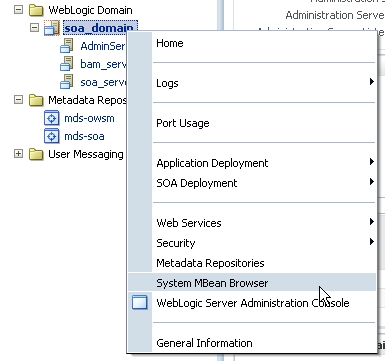 On the left go to : Farm_soa_domain > Weblogic Domain > soa_domain > right mouseclick and select ‘System MBean Browser’. 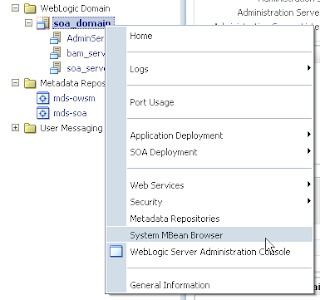 STEP 4 : Then Navigate to : Defined MBeans > oracle.soa.config > Server : soa_server1 > SCAComposite > your_project > SCAComposite.SCAComponent > your bpel_process. STEP 5 : Change the Value, and Apply.